At Frontier Anglers, because we believe the fishing in Southwest Montana is some of the best in the state, it is only fitting that we employ the best guides to reflect that. Our guides are professional, patient, knowledgeable, and above all, tons of fun to spend a day on the water with. "Having been an outfitter in Southwest Montana for a very long time, I feel we can offer our valued customers some of the very best fly fishing to be found. I have personally selected our guiding staff for their knowledge and personal commitment to every client. They are professionals, which will be very apparent after a day on the water with any of them." If you have ever fished with us before, or perhaps someone you know who has fished with us recommended a specific guide to you, feel free to request a guide when you book a trip with us. We will do our best to book you with that guide provided they have not already been booked with another client. Mike is, without a doubt, the bug guru among us. His knowledge of aquatic life and entomology is tempered by his down-to-earth demeanor and personality. He is very passionate about the Big Hole River in particular. Joe is one of the nicest guys you'll ever meet, on or off the stream. His fishing knowledge and background comes from years of guiding on the Missouri and now 20 years fishing and guiding the Beaverhead, Big Hole, and Madison Rivers. Dan started working for us back in the 80's. He has a B.S. in fishing (his friends will know how extensive his BS is) and is on the water over 100 days a season. He is a fun guy to fish with, knows where the fish are, and loves to share his knowledge about fish and women on a daily basis. Cody grew up in Dillon and knows the water around southwest Montana like the back of his hand. He is always up for anything, is a hoot to fish with, and can always provide and action-packed, fish-filled day on the water. Mike Hails from New Jersey, but his enthusiasm for fishing, bird hunting, and his Brittany, Mickey Finn, show he's Montana through and through. Having spent the last 7 years in southwest Montana, you won't find a more fun-loving, knowledgeable guy to spend your day with. Brian is our man on the Missouri where he has guided for over 25 years. He is one of the most pleasant guides to spend a day with on the water. Brian also works for us down here in Dillon whenever he's not on the "Mo." Eli is a friendly and laid back family man that prides himself on really knowing the waters of southwest Montana. Eli is a patient guide, he loves youngsters and experienced fisherman alike. Tim was one our first guides, starting way back in 1981. He knows the Beaverhead inside and out and offers a wealth of flavor and knowledge about all things fishing and many things non-fishing as well. Dave Evans has been with us for a few seasons now. He loves to see his clients hook into some of the monster Beaverhead River browns and rainbows. Dave is likable, relaxed, and a blast to fish with. 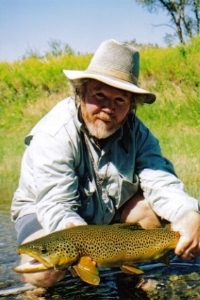 Bernard, or "Barnyard" as he is known locally, has been chasing trout around southwest Montana for a number of years. His enthusiasm is contagious and always welcome on the stream.